Have you ever been fooled by a “news” story on Facebook or Twitter? Forwarded something you later learned was not true? Surprised by incredible medical claims? 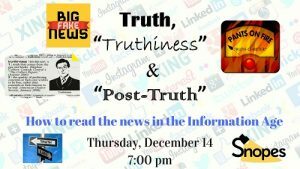 This workshop, led by Reference Librarian Lisa Shirley, will help you learn how to spot fake news, sponsored content, opinion pieces, and biased reporting. Learn how to read critically and use resources on the web for fact-checking. Don’t let fake news lead you astray!